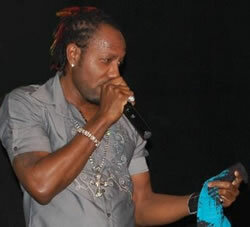 Fashozy international recording artiste, Da’Ville, is confirmed to perform on this year’s International Night 2 at Reggae Sumfest on Saturday, July 25 at Catherine Hall, Montego Bay venue. It will be the second time that the singer will be performing at the gigantic summer entertainment event. He performed on the event in 2007 where he gave a superb performance, which resulted in him being booked for several local and overseas shows. The singer, whose ‘Missing You Right Now’ went to #1 on most local and overseas charts, is still one of the most heavily requested and played songs on the airwaves and in the dancehalls locally and internationally. Another single, ‘Never Gonna Cry’, is also popping up on media charts, playlists, Internet radio stations and blog sites around the world and is fast heading for the top. It has just entered Richie B’s Top 20 charts. The song is touted to be the next big hit song for the singer. A video for the song in also being edited and will be released soon. Da’Ville is putting the final touches to a brand new album expected to be out soon. Studio engineers and persons who were privy to hear some of the tracks all say that the album is definitely going to be a Ã¢â‚¬Å“must haveÃ¢â‚¬Â. In April, Da’Ville gave an entertaining still talked about performance at New York’s top radio personality Squeeze’s Rock With Squeeze Mondays Party at the SOB. He then flew to Dominica where he dazzled Dominicans at the Krazy Kokonuts Club with a devastating performance. Da’Ville can next be seen in performance on tonight, June 3 at a show dubbed ‘Da’Ville Unplugged’ at Club Denim in New York. Since the A.R.P. singer went solo, his career continues to soar to higher heights. He has recorded a number of chart topping hit songs such as ‘Always On My Mind’, ‘Yesterday’, ‘Can’t Get Over You’, ‘This Time I Promise’, ‘Storm’ ‘Missing You’ and ‘In Heaven’.